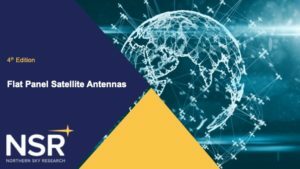 NSR’s Flat Panel Satellite Antennas, 4th Edition (FPA4) report is the leading and ONLY resource for analyzing the dynamic and fast-growing FPA market. 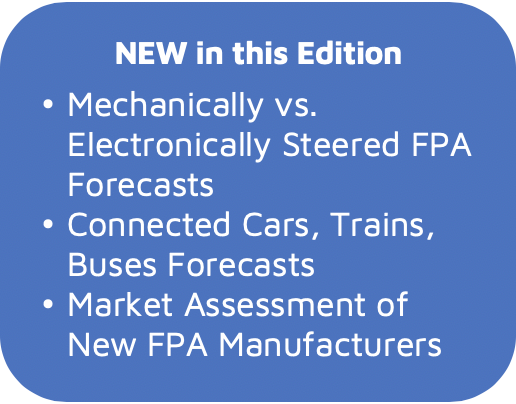 FPAs include mechanically and/or electronically-steered, low-profile, typically phased array, antennas that have been under development for some time, and are making a larger entrance to mobile and fixed broadband markets recently. This report provides a complete assessment on the business and technological development of FPAs, as well as an assessment of current and forecasted opportunities for shipped equipment in all applicable verticals and regions. NSR’s FPA4 report is segmented by two applications, Broadband Mobility and Fixed Applications. The Broadband Mobility segment of the report is further categorized by three vertical markets – Aeronautical, Maritime, and Land-mobile for both commercial and government players, while the Fixed Applications segment is broken down into three vertical markets – Broadband, Backhaul, and Satellite Video. Additionally, NSR’s FPA4 forecasts the market by in-service units, shipped units, and equipment revenues across 5 regions. TRL’s of prominent satellite FPA manufacturers are also qualitatively assessed in this report. Apart from being the only market report on the FPA industry, NSR’s leadership in HTS markets is continued in this report, as it touches almost every aspect of the satellite industry research conducted by NSR. 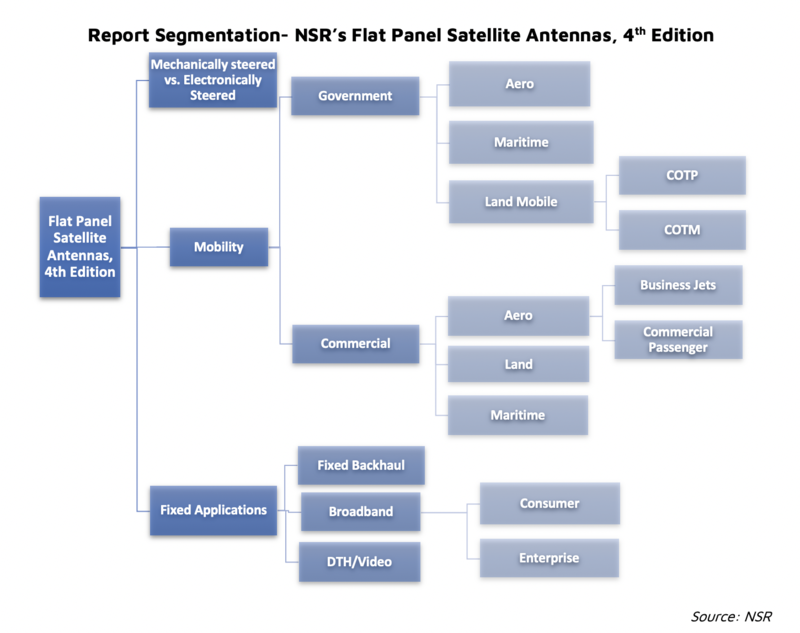 NSR’s Flat Panel Satellite Antennas, 4th Edition report is divided into 2 market segments – Broadband Mobility and Fixed Applications, which are further segmented into sub-verticals that are forecasted by region, and by frequency band. Companies and Organizations Mentioned in NSR’s FPA4: Airbus D&S, Air Esurfing, Alcan Systems, American Airlines, Anokiwave, Aqyr, Arralis, Asiasat, Avanti Communications, Ball Aerospace, Bentley, Bluesky Aviation Technologies, Boeing, Caterpillar, C-Com, CopaSAT, European Space Agency Business Incubation Centre, Eutelsat, Finnair, General Dynamics, GetSAT, Gilat, Global Eagle Entertainment, Gogo, hiSky, Hispasat, Honeywell, Hughes, Hunter Communications, Inmarsat, Inster, Isotropic Systems, Intellian, Intelsat, Kepler Communications, Kymeta Corporation, Newtec, OmniAccess, OneWeb, Panasonic, Penteon, Phasor Solutions, Qantas, QEST GmbH, Renfe, Scandinavian, Airlines System, Satcom Direct, SatCube, SatixFy, SatPro, SES, Sino TekCo, Spacecom, Speedcast, ST Electronics, STS Global, Tecom, Telesat, Thales Alenia Space, ThinKom, Toyota, United Airlines, United Kingdom Ministry of Defense, United Kingdom Space Agency, United States Air Force, United States Department of Defense, ViaSat, Vikomobile, and Vites.